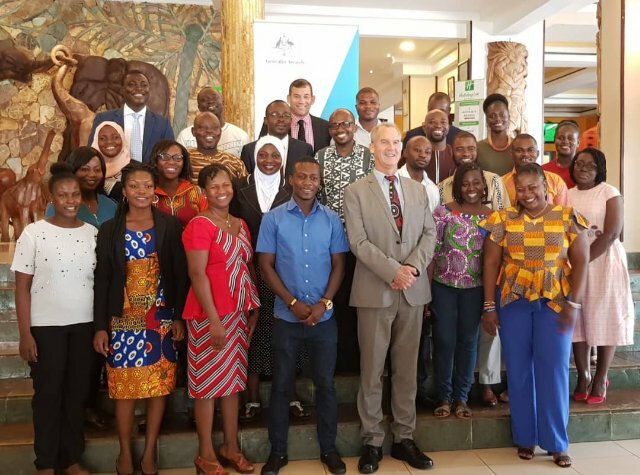 Twenty-one professionals from Ghana and two others from Côte d’Ivoire and Sierra Leone have been awarded an Australia Awards scholarship to undertake fully-funded Master’s studies in Australia. They are part of the 156 scholars selected across Africa to receive the prestigious Australian Government scholarships. The successful scholars will commence their studies at various Australian universities from January 2019, in diverse fields including public policy, engineering, mining, environmental studies, health, education, governance, agriculture and disability studies. Speaking at the opening of a two-day workshop to prepare the scholars ahead of their departure to Australia, the Australian High Commissioner to Ghana (accredited to Sierra Leone and Côte d’Ivoire), H.E. Mr Andrew Barnes, applauded the scholars on their selection. “You have demonstrated the leadership potential required to advance development in Africa. We are delighted that you will have this opportunity to develop your talent and expertise in Australia and we are confident that you will make an important contribution to national and regional development upon your return home,” Mr Barnes said. Recounting Australia’s credentials as a nation of boundless opportunities, High Commissioner Barnes challenged the scholars to take advantage of opportunities to establish lasting personal, professional and cultural links during their time in Australia. He further urged the Australia Awards recipients to be worthy ambassadors for their countries in Australia and encouraged them to return home with new skills, coupled with a passion for contributing to the development of their communities. As part of activities to prepare the West African scholars for their studies in Australia, the Australian Government is hosting a Pre-Departure Briefing in Accra from 6 – 7 November 2018. The two-day workshop will equip the scholars with valuable information about travelling to and settling in Australia, adapting to Australian climates and cultures, coping with their academic environment and developing strong professional networks. Scholars will also formulate workplans on how they will apply their newly acquired skills and knowledge towards contributing to their countries’ development when they return home. On Wednesday 7 November, the scholars will be hosted at an official send-off reception by the Australian High Commissioner to Ghana, H.E. Mr. Andrew Barnes. The Australia Awards is a flagship development assistance program of the Australian Government, providing world-class postgraduate training opportunities for African professionals. The Australia Awards program provides prestigious, all-expenses-paid Master’s and professional development Short Course scholarships to exceptional African candidates in areas where Australia has a known expertise. The scholarships are aimed at high calibre, early to mid-career professionals from the public sector, private sector and civil society. The Australia Awards program recognises that women bring a unique perspective and voice to the development needs of the African continent and that people living with disabilities face many barriers that limit their access to opportunities. In the 2019 cohort, 74 scholars (representing 47 percent of Australia Awards recipients) are women and seven (7) scholars have indicated that they have a disability. The 2018 application round for Australia Awards Master’s and Short Course scholarships will close on 3 December 2018 and 15 January 2019, respectively. Interested applicants should apply online at: www.australiaawardsafrica.org . Please direct any questions to [email protected] or [email protected] . The application process is open and merit-based, providing equal opportunities regardless of gender, ethnicity or disability. The Australian Government strongly encourages applications from women and persons with disabilities. Mechanisms are in place to support the participation of applicants and finalists requiring assistance.